Narrowing down my Top 12 PC additions of 2017 was not an easy task. I added so many needed cards, 90% through trades, to my PC last year so I knew it would be a challenge. I could have easily done a Top 50 list. But instead of doing that and taking a week to post them, I did my best to narrow it down to 12 and giving reasons for each and why they made their way on here. That does not mean the cards left off I didn't appreciate, it was just these ones stood out. 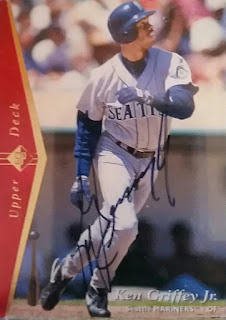 Number 1 is this 1995 Sp Ken Griffey Jr autograph. This one gets tops because it is a great looking card but it was also acquired from a trade with my father who I got back into the hobby. 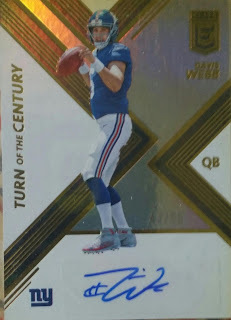 This was our first trade in 20 years so this card holds a special place in my collection. 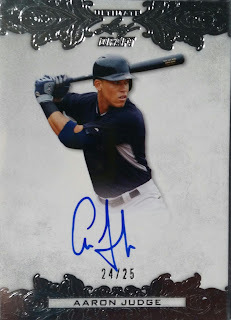 Number 2 is this super sweet Aaron Judge autograph I added from a trade with Project Pedro Blog. 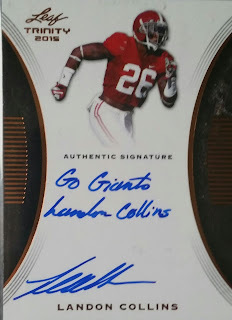 We have pulled off so many big trades and this card was apart of another and my first Judge autograph for that PC. Number 3 is one of multiple Odell Beckham Jr rookie autographs I own but in what was a sad year for the NY Giants, this was a welcomed trade addition. The Giants are gonna pay this guy the big bucks because looking at the offense without him is a sad, sad state. 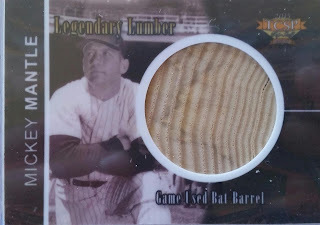 Number 4 is this Mickey Mantle bat swatch. 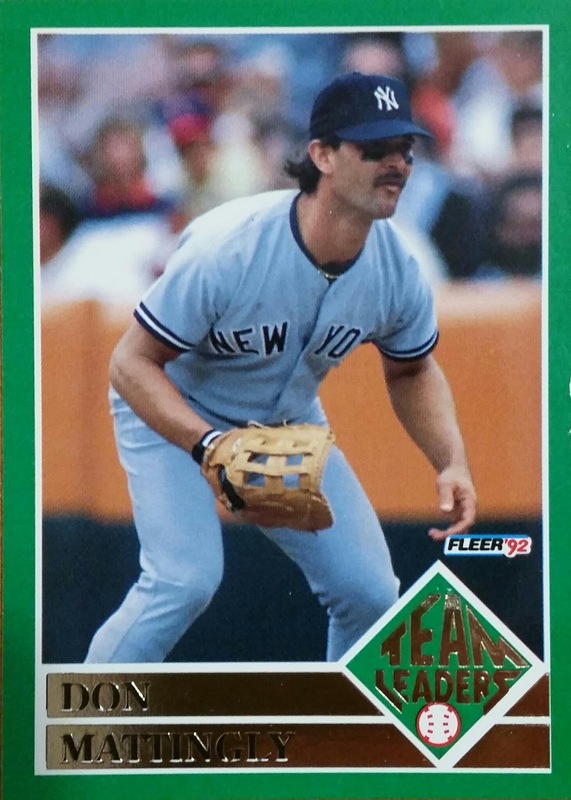 Great looking card and a huge swatch of one of the Yankee greats. By far my best Mantle card. I just hope it's an authentic swatch coming from an oddball company. Number 5 was from a major trade I pulled off. 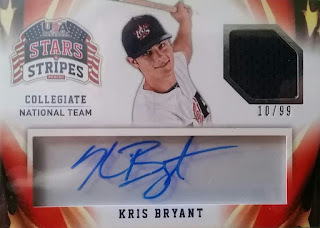 I was in need of a Kris Bryant autograph and through many discussions I was able to pull off a trade for one. My only concern is the acetate he signed on and hoping it doesn't fade over time. 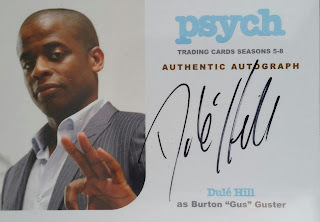 Number 6 was one of the final cards I needed for my Psych Seasons 5-8 autograph set. These normally don't fall for cheap and landing this one under $25 was a steal. 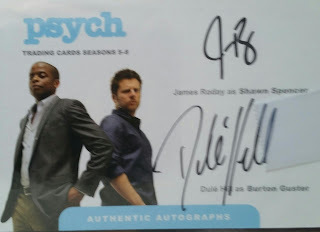 Number 7 speaking of cards to finish off my Psych Autograph set from seasons 5-8 was this dual bad boy. These usually go for over $100 but landing one under $60 was amazing. 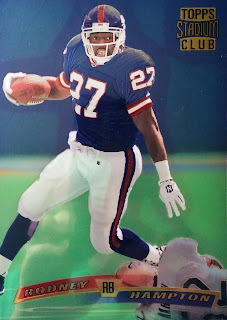 I once again owe 90's Niche Football Card Blog a huge thanks for pulling 6 and 7 off for me. Number 8 is another Griffey autograph. It's Griffey, deal with it. This is another from one of those Project Pedro Blog greatest hit trades. 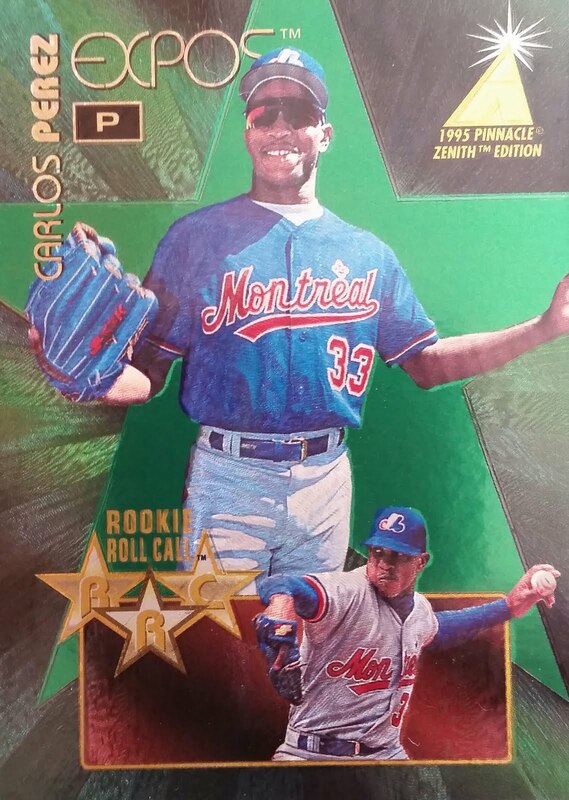 Number 9 is my rarest 90's card I own. Got this card in a trade with Project Pedro Blog. These don't go for cheap and are extremely tough to find. 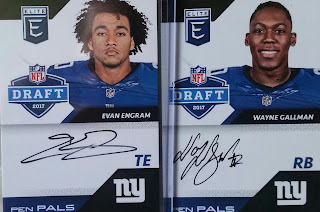 Number 10 is my first inscription autograph and it doesn't get any better when it says Go Giants and is a Pro Bowl safeties signature. Once again, this card was acquired through trade from a new trade partner. 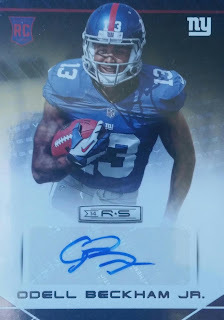 Number 12 is also from @DJSeneseiNJ and possibly the future of the Giants? Hard to tell. They didn't give this guy one snap all year and now they go into the offseason with the second overall pick, their highest in some time, and a chance to grab the future behind Eli. Do they do that or do they have a plan for Webb is yet to be seen. Number 12A is a tough, tough find. Luckily for me I found a seller who had one listed for $5 as opposed to the only other one I have seen that's listed for $65. I almost would have dumped the full amount on the card at some point just to own it since I never saw another listed. Glad I waited. Well, there you have it, my Top 12, well 14 technically but some are tied, cards of 2017. I hope my Top 12 of 2018 will be just as impressive. It definitely will not be easy to match this awesomeness, but I will try very hard. 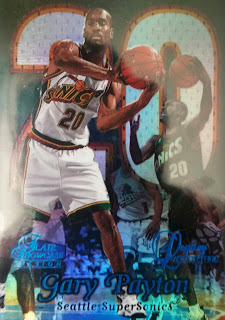 Don't really collect basketball anymore... but I love The Glove. The Griffey SP isn't too shabby either. The 22-Year Search Is Over!